My daughter showed up last week, and that girl is ALL about Christmas. She loves it so much, she celebrates half Christmas, and then starts counting down the days starting in August. Have I mentioned she's 25? lol Well, when she saw The Berenstain Bears book sitting on my couch, she squealed in delight! Thank goodness I'm reviewing it. I guess this will be one of her gifts this year. Celebrate Christmas fun with the Bear family and their Bear Country friends and neighbors. 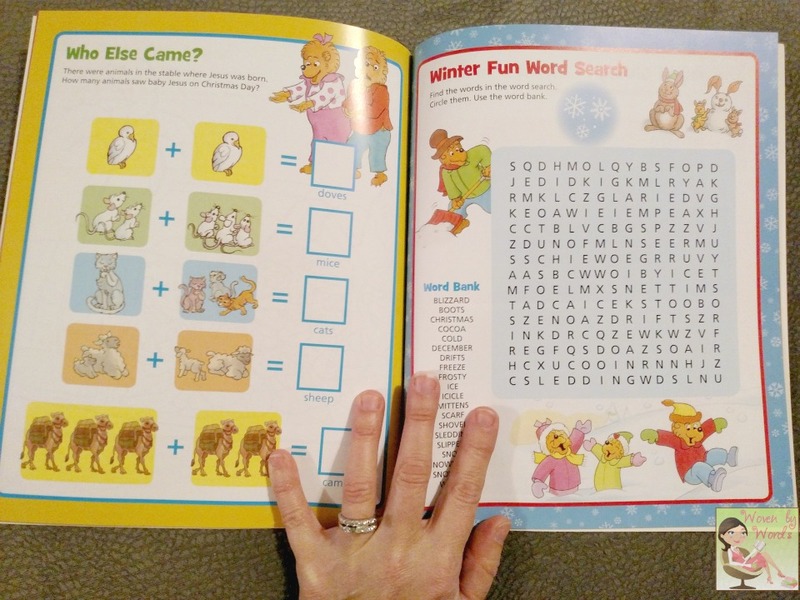 Featuring Papa, Mama, Brother, Sister, and Honey and the rest of the Bear Country gang, kids are sure to find lots to do helping Honey Bear find the missing piece of the Bear family Nativity scene, doing crosswords and word searches with Brother and Sister, and even helping out at the Christmas Eve service at Chapel in the Woods. I was surprised at how big this book was. I loved it! Each page is framed by a thick Christmas-y design. 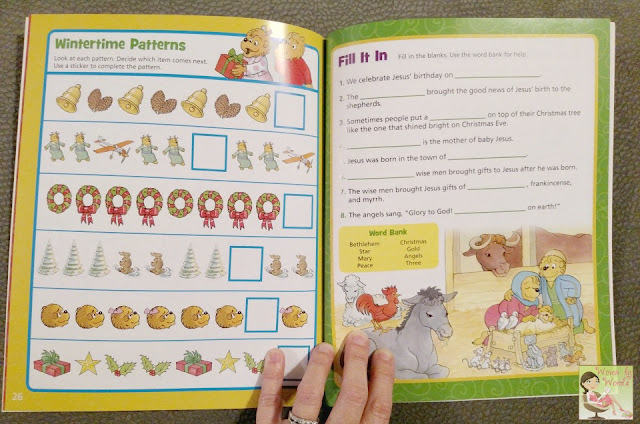 The Christmas Fun Sticker & Activity Book talks about Christmas in the modern sense and also the birth of Jesus! I love this so much because so many families celebrate with both on their minds. The activities are large, and just the right size for an elementary child. There's nothing like celebrating the season with the Berenstain Bears. The reusable stickers means they can definitely be played with over and over again. Your children can each have a turn with them, and even their friends can have a go at them. This can be a book that focuses on the days leading up to Christmas or you can even give it as a stocking stuffer. It might be a big stocking stuffer. Maybe leave it for the kids to have as an activity to keep them busy early Christmas morning until everyone is awake. You can see by the images the size of the book. These are just a couple page spreads to give you an idea of what they look like! Aren't they fantastic? In the photo below, you can see the balance between Christmas and Jesus' birth. Any child will enjoy this book. I love THE CHRISTMAS STORY FOR CHILDREN. I would also like the Berenstain Bears and the Christmas Angel. We haven't read that one yet. I would also love the The Berenstain Bears and the Christmas Angel book! I would love to have the THE BERENSTAIN BEARS AND THE CHRISTMAS ANGEL. I would love THE BERENSTAIN BEARS AND THE CHRISTMAS ANGEl, THE BERENSTAIN BEARS, THE VERY FIRST CHRISTMAS, & A NIGHT OF GREAT JOY for my kids. My son would like their SONG OF THE STARS book! SONG OF THE STARS looks beautiful! It would surely be a family tradition to read it every year. The Beginner's Bible The Very First Christmas would be a great book to have. I;d like the book "Goodnight Manger." I'd also like to have A Night of Great Joy for my grandsons. I would like the THE PERFECT CHRISTMAS PAGEANT by Joyce Meyer for my daughter. 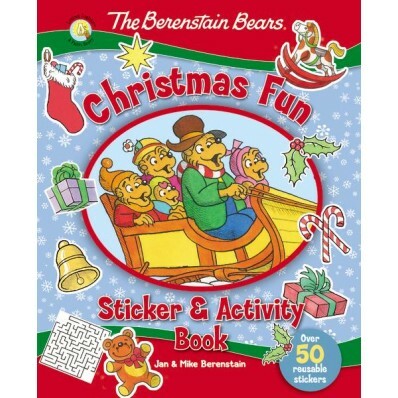 I would love THE BERENSTAIN BEARS, THE VERY FIRST CHRISTMAS! I would love to get the The Berenstain Bears And The Christmas Angel! Also would like to get THE CHRISTMAS STORY FOR CHILDREN by Max Lucado. Christmas Love Letters from God. THE FIRST CHRISTMAS EVER would be a great book for the kids. Thanks. A Night of Great Joy sounds lovely as well. I think my kids would also enjoy 'The Three Wise Guys'. I like the Get Ready for Christmas Berenstain Bears book. I like the Good Night Manger book. I would love the Perfect Christmas Pageant. These books are really adorable. My daughter would love to have the Girl Power book from the Young Adult section!